Every time I write an article for BLADE magazine, I ask purveyors and collectors to name the top 4 or 6 knife makers in the world. Steigerwalt is named 90 percent of the time. Here is a magnificent folding dagger engraved by Martin Butler. Profuse gold inlays of birds and flowers. Bolino engravings of beautiful ladies are like small, exquisite portraits. Damasteel blade. 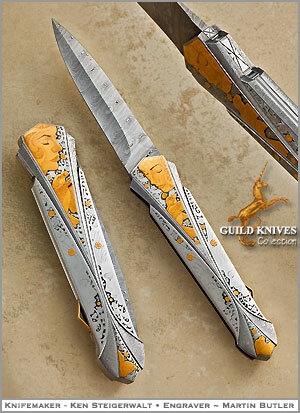 Profuse 18K gold engravings and bolino work all over the knife.